Saint Albert the Great was born some time before the year 1200 in Lauingen, a town in Southern Germany. The son of a military lord in the army of Emperor Frederick II, Albert was educated at the University of Padua where he learned about the philosopher Aristotle and his writings. The teachings of Aristotle would also become the foundation of Albert’s later work. Around 1223, Albert chose to join the Dominican Order after a miraculous encounter with the Blessed Virgin Mary. He also pursued studies in theology excelling as a student. He later became a lecturer, first he taught the Dominicans at Cologne and then he traveled around the region to teach. He became well known as a lecturer not just in the region but internationally. During the time that Albert started lecturing he also produced “Summa de Bono,” a collaboration he had with renowned French theologian Phillip the Chancellor. Albert didn’t just stop at being a lecturer, though. Albert became a master of theology under the guidance of Gueruc of Saint-Quentin, becoming the first German Dominican to achieve this title. 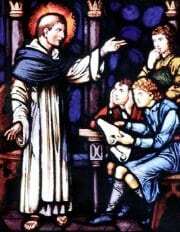 Saint Albert the Great taught theology at the University of Paris as a full-time professor. He also became the Chair of Theology at the College of St. James. The renowned philosopher, priest and theologian Thomas Aquinas was one of his students. In 1254, Albert became the provincial of the Dominican Order and was recognized for being a competent and efficient administrator. 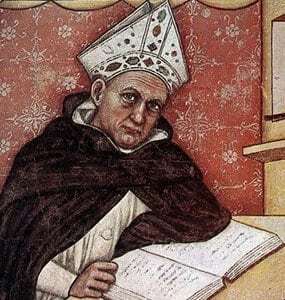 Five years later, he took part in the General Chapter of the Dominicans at Valenciennes along with Thomas Aquinas, masters Bonushomo Britto, Florentius and Peter who would later become Pope Innocent V. Together they established a program of studies specially for the Dominicans that emphasized philosophy as an innovation for those who were not adequately trained to study theology. Saint Albert the Great was appointed bishop of Regensburg by Pope Alexander IV in 1260. During the course of his duties, he became well known for his humility which he demonstrated in various ways. For example, he refused to ride a horse when traversing his huge diocese and instead chose to travel on foot. This earned him the affectionate name of “Boots the Bishop” from his parishioners. In 1263, Pope Urban IV relieved Albert of his bishop duties and tasked him with preaching the eighth Crusade in German-speaking countries. He then became well known for acting as a mediator between conflicting parties. One of his notable efforts as a mediator was in 1258 when he brought an end to the conflict between the people of Cologne and the archbishop. The writings of Saint Albert the Great, which reached 38 volumes, show his vast knowledge on a variety of subjects including logic, theology, botany, astronomy, mineralogy, alchemy, zoology, physiology, phrenology, law and geography. Aside from his own writings, Saint Albert the Great also became the first to comment on the writings of Aristotle which made the ancient Greek philosopher ’s body of work more accessible to academic debate. In fact he was responsible for preserving and presenting most modern knowledge of Aristotle. Albert’s principal theological works are a commentary in three volumes on the Books of the Sentences of Peter Lombard and the Summa Theologiae in two volumes. He also wrote treatises on the natural sciences. Albert also built a reputation as a scientist. While in Cologne, he performed experiments in chemistry and physics in a makeshift laboratory. He accumulated a collection of plants, insects and chemical compounds. Through his scientific work, Saint Albert the Great demonstrated that all creation pointed toward God and that even the tiniest bit of scientific knowledge revealed something about Him. 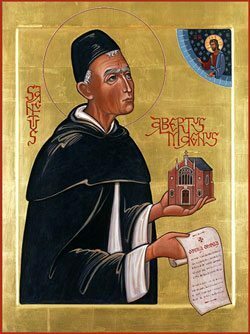 Saint Albert the Great spent the last years of his life defending the work of his student Thomas Aquinas whose contributions are considered to be among the most influential in the Catholic Church. After suffering a decline in his health in 1278, Albert died in November 15, 1280 in the Dominican convent in Cologne, Germany. Three years after his death his grave was opened and his body was discovered to be incorrupt. Since November 15, 1954, the relics of Saint Albert the Great are contained in a Roman sarcophagus in the crypt of the Dominican St. Andreas Church in Cologne. Saint Albert the Great was beatified in 1622. On December 16, 1931, he was canonized and proclaimed a Doctor of the Church. He is the patron saint of natural sciences, philosophers, scientists, students and medical technicians.